French mathematician and physicist who was a child prodigy. In mathematics, he developed a theory of probabilities. In physics, he invented the hydraulic press and formulated Pascal’s Law for pressure. La puissance des mouches. Elles gagnent des batailles, empêchent notre âme d’agir, mangent notre corps. Flies are so mighty that they win battles, paralyse our minds, eat up our bodies. Pensées (1670), No. 367, translated by A. J. Krailsheimer (1995), 6. Original French text in Pensées de Pascal: publiées dans leur texte authentique (1866), Vol. 1, 176, No. 120. L’homme n’est qu’un roseau, le plus faible de la nature, mais c’est un roseau pensant. Il ne faut pas que l’univers entier s’arme pour l’écraser; une vapeur, une goutte d’eau suffit pour le tuer. Mais quand l’univers l’écraserait, l’homme serait encore plus noble que ce qui le tue, parce qu’il sait qu’il meurt et l’avantage que l’univers a sur lui; l’univers n'en sait rien. Man is a reed, the feeblest thing in nature. But a reed that can think. The whole universe need not fly to arms to kill him ; for a little heat or a drop of water can slay a man. But, even then, man would be nobler than his destroyer, for he would know he died, while the whole universe would know nothing of its victory. Pensées. As given and translated in Hugh Percy Jones (ed. ), Dictionary of Foreign Phrases and Classical Quotations (1908), 292. L’homme n’est qu’un roseau, le plus faible de la nature; mais c’est un roseau pensant. Man is but a reed, the weakest thing in nature; but a thinking reed. Pensées (1670), Section 1, aphorism 160. In H.F. Stewart (ed. ), Pascal’s Pensées (1950), 83. On se persuade mieux, pour l’ordinaire, par les raisons qu’on a soi-même trouvées, que par celles qui sont venues dans l’esprit des autres. 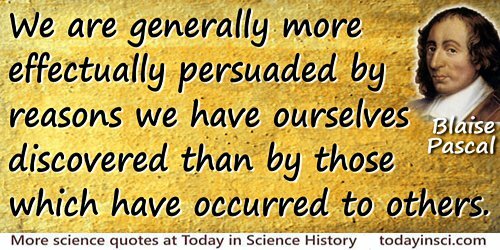 We are generally more effectually persuaded by reasons we have ourselves discovered than by those which have occurred to others. Pensées (1670), Section 1, aphorism 18. In H. F. Stewart (ed. ), Pascal's Pensées (1950), 11. Original French text in Pensées de Pascal: publiées dans leur texte authentique (1866), Vol. 1, 99. Puisqu'on ne peut être universel en sachant tout ce qui se peut sur tout, il faut savoir peu de tout. Car il est bien plus beau de savoir quelque chose de tout que de savoir rout d'une chose; cette universalité est la plus belle. Si on pouvait avoir les deux, encore mieux. Since we cannot be universal and know all that is to be known of everything, we ought to know a little about everything, For it is far better to know something about everything than to know all about one thing. Pensées. Quoted in Nigel Rees, Brewer's Famous Quotations: 5000 Quotations and the Stories Behind Them (2006), 249. A game is on, at the other end of this infinite distance, and heads or tails will turn up. What will you wager? According to reason you cannot leave either; according to reason you cannot leave either undone... Yes, but wager you must; there is no option, you have embarked on it. So which will you have. Come. Since you must choose, let us see what concerns you least. You have two things to lose: truth and good, and two things to stake: your reason and your will, your knowledge and your happiness. And your nature has two things to shun: error and misery. Your reason does not suffer by your choosing one more than the other, for you must choose. That is one point cleared. But your happiness? Let us weigh gain and loss in calling heads that God is. Reckon these two chances: if you win, you win all; if you lose, you lose naught. Then do not hesitate, wager that He is. Pensées (1670), Section I, aphorism 223. In H. F. Stewart (ed. ), Pascal's Pensées (1950), 117-119. All err the more dangerously because each follows a truth. Their mistake lies not in following a falsehood but in not following another truth. From Pensées, as translated in W.H. Auden and L. Kronenberger (eds.) The Viking Book of Aphorisms (1966), 325. From the original French, “Tous errent d'autant plus dangereusement qu’ils suivent chacun une vérité. Leur faute n’est pas de suivre une fausseté, mais de ne pas suivre une autre vérité,” in Oeuvres Complètes (1864), Vol. 1, 363. All the unhappiness of men arises from one single fact, that they cannot stay quietly in their own chamber. In Pensées (1670), Section 4, No. 2. As translated in Blaise Pascal and W.F. Trotter (trans. ), 'Thoughts', No. 139, collected in Charles W. Eliot (ed. ), The Harvard Classics (1910), Vol. 48, 52. Also seen translated as, “The sole cause of man’s unhappiness is that he does not know how to stay quietly in his room.” From the original French, “Tout le malheur des hommes vient d’une seule chose, qui est de ne savoir pas demeurer en repos, dans une chambre,” in Ernest Havet (ed. ), Pensées de Pascal (1892), 152. From Pensées as translated in W.H. Auden and L. Kronenberger (eds.) The Viking Book of Aphorisms (1966), 325. From the original French, “Ni la contradiction n’est marque de fausseté ni l’incontradiction n’est marque de vérité,” in 'Pensées', Oeuvres Complètes (1864), Vol. 1, 261. Every gambler stakes a certainty to gain an uncertainty, and yet he stakes a finite certainty against a finite uncertainty without acting unreasonably. … The uncertainty of gain is proportioned to the certainty of the stake, according to the proportion of chances of gain and loss, and if therefore there are as many chances on one side as on the other, the game is even. In Blaise Pascal and C. Kegan Paul (trans. ), 'Of The Need of Seeking Truth', The Thought of Blaise Pascal: Translated from the Text of M. Auguste Molinier (1905), 98. Everything that is written merely to please the author is worthless. Quoted without citation in W.H. Auden and L. Kronenberger (eds.) The Viking Book of Aphorisms (1966), 279. Webmaster has tried without success to locate a primary source. Can you help? Faith is different from proof; the latter is human, the former is a Gift from God. In Pensées (1670), Section 10, 11. As translated in Blaise Pascal and W.F. Trotter (trans. ), 'Thoughts', No. 248, collected in Charles W. Eliot (ed. ), The Harvard Classics (1910), Vol. 48, 92. From the original French, “La foi est différente de la preuve: l’une est humaine, l’autre est un don de Dieu,” in Ernest Havet (ed. ), Pensées de Pascal (1892), 276. Few men speak humbly of humility, chastely of chastity, skeptically of skepticism. From Pensées (1670), Sect. 6, Aphorism 20, as translated in W.H. Auden and L. Kronenberger (eds.) The Viking Book of Aphorisms (1966), 38. From the original French, “Peu parlent de l’humilité humblement; peu, de la chasteté chastement; peu, du pyrrhonisme en doutant,” in 'Pensées', Oeuvres Complètes (1864), Vol. 1, 276. I cannot judge my work while I am doing it. I have to do as painters do, stand back and view it from a distance, but not too great a distance. How great? Guess. Quoted without citation in W.H. Auden and L. Kronenberger (eds.) The Viking Book of Aphorisms (1966), 291. Webmaster has tried without success to locate a primary source. Can you help? I have made this one [letter] longer than usual because I did not have the leisure to make it shorter. The Provincial Letters, Letter XVI, to the Reverend Jesuit Fathers (4 Dec 1656), ed. A. J. Krailsheimer (1967), 257. I have spent much time in the study of the abstract sciences; but the paucity of persons with whom you can communicate on such subjects disgusted me with them. When I began to study man, I saw that these abstract sciences are not suited to him, and that in diving into them, I wandered farther from my real object than those who knew them not, and I forgave them for not having attended to these things. I expected then, however, that I should find some companions in the study of man, since it was so specifically a duty. I was in error. There are fewer students of man than of geometry. 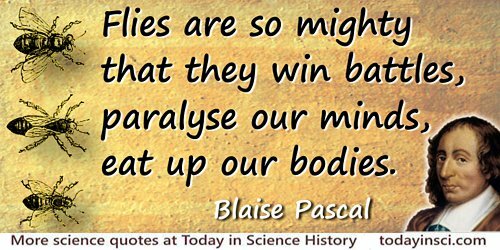 Thoughts of Blaise Pascal (1846), 137. I will paint for [man] not only the visible universe, but all that he can conceive of nature’s immensity in the womb of an atom. In 'The Misery of Man Without God', Blaise Pascal (1910), Vol. 48, 27, as translated by W.F. Trotter. It is not certain that everything is uncertain. As in Blaise Pascal and Roger Ariew (ed., trans. ), 'Folders Set Aside June 1658', Pensées (2004), 141, (S453/L521). From the French, “Il n’est pas certain que tout soit incertain,” in Blaise Pascal and ‎Armand-Prosper Faugère (ed. ), Pensées, Fragments et Lettres de Blaise Pascal (1814), Vol. 2, 99; labelled “(Barré)”: (erased). It is the heart which experiences God, and not the reason. In Pensées (1670), Section 26, No. 5. From Blaise Pascal, W.F. Trotter (trans. ), 'Thoughts', collected in Charles W. Eliot (ed. ), The Harvard Classics (1910), Vol. 48, 99. Also seen translated as, “It is the heart which perceives God, and not the reason”. From the French, “C'est le cœur qui sent Dieu, et non la raison,” in Ernest Havet (ed. ),Pensées de Pascal (1852), 296. 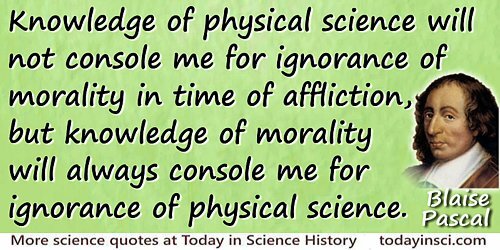 Knowledge of physical science will not console me for ignorance of morality in time of affliction, but knowledge of morality will always console me for ignorance of physical science. Pensées (1670), No. 23, translated by A. J. Krailsheimer (1995), 6. Let him look at that dazzling light hung aloft as an eternal lamp to lighten the universe; let him behold the earth, a mere dot compared with the vast circuit which that orb describes, and stand amazed to find that the vast circuit itself is but a very fine point compared with the orbit traced by the stars as they roll their course on high. But if our vision halts there, let imagination pass beyond; it will fail to form a conception long before Nature fails to supply material. The whole visible world is but an imperceptible speck in the ample bosom of Nature. No notion comes near it. Though we may extend our thought beyond imaginable space, yet compared with reality we bring to birth mere atoms. Nature is an infinite sphere whereof the centre is everywhere, the circumference nowhere. In short, imagination is brought to silence at the thought, and that is the most perceptible sign of the all-power of God. Let man reawake and consider what he is compared with the reality of things; regard himself lost in this remote corner of Nature; and from the tiny cell where he lodges, to wit the Universe, weigh at their true worth earth, kingdoms, towns, himself. What is a man face to face with infinity? Pensées (1670), Section 1, aphorism 43. In H. F. Stewart (ed. ), Pascal’s Pensées (1950), 19. Let no one say that I have said nothing new; the arrangement of the subject is new. When we play tennis, we both play with the same ball, but one of us places it better. In Pensées (1670), Section 7, No. 9. From Blaise Pascal and W.F. Trotter (trans. ), 'Thoughts', collected in Charles W. Eliot (ed. ), The Harvard Classics (1910), Vol. 48, 14. From the French, “Qu’on ne dise pas que je n’ai rien dit de nouveau: la disposition des matières est nouvelle. Quand on joue à la paume, c’est une même balle dont on joue l’un et l’autre; mais l’un la place mieux,” in Oeuvres Complètes de Blaise Pascal (1864), Vol. 1, 287. Let us weigh the gain and the loss in wagering that God is. Let us consider the two chances. If you gain, you gain all; if you lose, you lose nothing. Wager then without hesitation that He is. In Pensées (1670), Section 10. From Blaise Pascal and W.F. Trotter (trans. ), 'Thoughts', collected in Charles W. Eliot (ed. ), The Harvard Classics (1910), Vol. 48, 85. Also seen translated as, “…consider the two possibilities…”. From the French, “Pesons le gain et la perte, en prenant croix, que Dieu est. Estimons ces deux cas: si vous gagnez, vous gagnez tout; si vous perdez, vous ne perdez rien. Gagez donc qu’il est, sans hésiter,” in Oeuvres Complètes de Blaise Pascal (1864), Vol. 1, 304. Logic has borrowed the rules of geometry without understanding its power. … I am far from placing logicians by the side of geometers who teach the true way to guide the reason. … The method of avoiding error is sought by every one. The logicians profess to lead the way, the geometers alone reach it, and aside from their science there is no true demonstration. Look somewhere else for someone who can follow you in your researches about numbers. For my part, I confess that they are far beyond me, and I am competent only to admire them. In Letter (27 Oct 1654), the third from Pascal to Fermat. As translated in George F. Simmons, Calculus Gems: Brief Lives and Memorable Mathematics (2007), 103. From the original French, “Cherchez ailleurs qui vous suive dans vos inventions numériques,… pour moi je vous confesse que cela me passé de bien loin: je ne fuis capable que de les admirer,” in Francis Maseres,Scriptores Logarithmici: Or, a Collection of Several Curious Tracts on the Nature and Construction of Logarithms (1801), Vol. 4, 495. Man is but a reed, the most feeble thing in nature; but he is a thinking reed. Man is full of desires: he loves only those who can satisfy them all. “This man is a good mathematician,” someone will say. But I have no concern for mathematics; he would take me for a proposition. “That one is a good soldier.” He would take me for a besieged town. I need, that is to say, a decent man who can accommodate himself to all my desires in a general sort of way. From Pensées (1670), Sect. 6, Aphorism 18. As translated in W.H. Auden and L. Kronenberger (eds.) The Viking Book of Aphorisms (1966), 199. From the original French, “L’homme est plein de besoins: il n’aime que ceux qui peuvent les remplir tous. ‘C’est un bon mathématicien,’ dira-t-on. Mais je n’ai que faire de mathématiques; il me prendroit pour une proposition. ‘C’est un bon guerrier.’ Il me prendroit pour une place assiégée. Il faut donc un honnête homme qui puisse s’accommoder à tous mes besoins généralement,” in Oeuvres Complètes de Blaise Pascal (1858), Vol. 1, 276. Men despise religion; they hate it, and they fear it is true. In Pensées (1670), Section 16, No. 26. From Blaise Pascal and W.F. Trotter (trans. ), 'Thoughts', collected in Charles W. Eliot (ed. ), The Harvard Classics (1910), Vol. 48, 68. From the French, “Les hommes ont mépris pour la religion; ils en ont haine, et peur qu’elle soit vraie,” in Pensées de Blaise Pascal (1847), 203. Nature … is an infinite sphere of which the center is everywhere and the circumference nowhere. In Pensées (1670), Section 16, No. 26. From Blaise Pascal and W.F. Trotter (trans. ), 'Thoughts', collected in Charles W. Eliot (ed. ), The Harvard Classics (1910), Vol. 48, 26. From the French, “La nature … est une sphère infinie dont le centre est partout, la circonférence nulle part,” in Pensées de Blaise Pascal (1847), 227-228. Our nature consists in motion; complete rest is death. In Pensées (1670), Section 23, No. 67. From Blaise Pascal and W.F. Trotter (trans. ), 'Thoughts', collected in Charles W. Eliot (ed. ), The Harvard Classics (1910), Vol. 48, 50. Also seen translated as “…in movement, absolute rest…”. From the French, “Notre nature est dans le mouvement; le repos entier est la mort,” in Pensées de Blaise Pascal (1847), 315. Our notion of symmetry is derived from the human face. Hence, we demand symmetry horizontally and in breadth only, not vertically nor in depth. In Pensées (1670), Section 1, No. 28. As paraphrased in W.H. Auden and L. Kronenberger (eds.) The Viking Book of Aphorisms (1966). From the more complete translation, “Symmetry is what we see at a glance; based on the fact that there is no reason for any difference, and based also on the face of man; whence it happens that symmetry is only wanted in breadth, not in height or depth,” in Blaise Pascal and W.F. Trotter (trans. ), 'Thoughts', collected in Charles W. Eliot (ed. ), The Harvard Classics (1910), Vol. 48, 15. From the French, “Symétrie, en ce qu’on voit d’une vue, fondée sur ce qu’il n’y a pas de raison de faire autrement: et fondée aussi sur la figure de l’homme, d’où il arrive qu’on ne veut la symétrie qu’en largeur, non en hauteur ni profondeur,” in Blaise Pascal and Léon Brunschvicg (ed. ), Pensées de Blaise Pascal (1904), Vol. 1, 37-38. Perfect clarity would profit the intellect but damage the will. Religion is so great a thing that it is right that those who will not take the trouble to seek it if it be obscure, should be deprived of it. In Pensées (1670), Section 24, No. 10. As translated in Blaise Pascal and W.F. Trotter (trans. ), 'Thoughts', No. 574, collected in Charles W. Eliot (ed. ), The Harvard Classics (1910), Vol. 48, 92. From the original French, “La religion est une chose si grande, qu’il est juste que ceux qui ne voudraient pas prendre la peine de la chercher, si elle est obscure, en soient privés,” in Ernest Havet (ed. ), Pensées de Pascal (1892), 422. Rivers are roads which move, and which carry us whither we desire to go. In Pensées. As translated by W.F. Trotter in Blaise Pascal: Thoughts, Letters, and Minor Works (1910), 13. The chief malady of man is restless curiosity about things which he cannot understand; and it is not so bad for him to be in error as to be curious to no purpose. Blaise Pascal and A. J. Krailsheimer (trans. ), Pensées (1966, Rev. ed. 1995), 66. In Pensées (1670), Section 7, No. 1. As translated in Blaise Pascal and W.F. Trotter (trans. ), 'Thoughts', No. 7, collected in Charles W. Eliot (ed. ), The Harvard Classics (1910), Vol. 48, 10. Also seen translated as, “The more intelligent one is, the more men of originality one finds. Ordinary people find no difference between men.” From the original French, “A mesure qu’on a plus d’esprit, on trouve qu’il y a plus d’hommes originaux. Les gens du commun ne trouvent pas de différence entre les hommes,” in Ernest Havet (ed. ), Pensées de Pascal (1892), 205. In Pascal’s Pensées (1958), 4. The heart has its reasons which reason does not know. In Pensées (1670). As translated in Blaise Pascal and W.F. Trotter (trans. ), 'Thoughts', collected in Charles W. Eliot (ed. ), The Harvard Classics (1910), Vol. 48, 99. From the original French, “Le cœur a ses raisons, que la raison ne connaît point,” in Blaise Pascal and Armand-Prosper Faugère (ed. ), Pensées, Fragments et Lettres de Blaise Pascal (1814), Vol. 2, 172. The last proceeding of reason is to recognize that there an infinity of things which are beyond it. Pensées (1670), Section 5, 1. As translated in Blaise Pascal and W.F. Trotter (trans. ), 'Thoughts', No. 267, collected in Charles W. Eliot (ed. ), The Harvard Classics (1910), Vol. 48, 97. Also seen translated as, “Reason’s last step is the recognition that…”. From the original French, “La dernière démarche de la raison est de reconnaître qu’il y a une infinité de choses qui la surpassent; elle n’est que faible, si elle ne va jusqu’à connaître cela,” in Pensées de Blaise Pascal (1847), 110. The last thing one settles in writing a book is what one should put first. In Pensées (1670), Section 7, No. 29. As translated in Blaise Pascal and W.F. Trotter (trans. ), 'Thoughts', No. 19, collected in Charles W. Eliot (ed. ), The Harvard Classics (1910), Vol. 48, 14. Also seen translated as, “The last thing one knows when writing a book is what to put first.” From the original French, “La dernière chose qu’on trouve en faisant un ouvrage, est de savoir celle qu’il faut mettre la première,” in Ernest Havet (ed. ), Pensées de Pascal (1892), 223. The last thing one settles in writing a book is what one should put in first. In Pensées. As translated by W.F. Trotter in Blaise Pascal: Thoughts, Letters, and Minor Works (1910), 14. The parts of the universe … all are connected with each other in such a way that I think it to be impossible to understand any one without the whole. Pensées, no. 72. Quoted in Erhard Scheibe and Brigitte Falkenburg (ed), Between Rationalism and Empiricism: Selected Papers in the Philosophy of Physics (2001), 25. The state of man is changeableness, ennui, anxiety. Condition de l’homme, inconstance, ennui, inquietude. From Pensées Art. vi, 46. In Craufurd Tait Ramage, Beautiful Thoughts from French and Italian Authors (1866), 239. There are then two kinds of intellect: the one able to penetrate acutely and deeply into the conclusions of given premises, and this is the precise intellect; the other able to comprehend a great number of premises without confusing them, and this is the mathematical intellect. The one has force and exactness, the other comprehension. Now the one quality can exist without the other; the intellect can be strong and narrow, and can also be comprehensive and weak. There are three leading objects in the study of truth:—one, to discover it; another, to demonstrate it when discovered; the last, to separate it from all admixture of falsehood. As translated in Blaise Pascal and M.P. Faugère (trans. ), 'On The Geometrical Spirit', collected in The Miscellaneous Writings of Pascal; Consisting of Letters, Essays, Conversations, and Miscellaneous Thoughts (1849), 73. From the original French, “On peut avoir trois principaux objets dans l’etude de la vérité: l’un, de la découvrir quand on la cherche; l’autre, de la démontrer quand on la possède; le dernier, de la discerner d'avec le faux quand on l’examine,” in 'De l'Esprit Géométrique', Pascal: Opuscules Philosophiques (1887), 82. For an alternative translation, see the quote beginning, “We may have three principal objects…” on the Blaise Pascal Quotes page of this website. There are two types of mind … the mathematical, and what might be called the intuitive. The former arrives at its views slowly, but they are firm and rigid; the latter is endowed with greater flexibility and applies itself simultaneously to the diverse lovable parts of that which it loves. In Discours sur les passions de l’amour (1653). They say that habit is second nature. Who knows but nature is only first habit? As quoted in epigraph in Edward Kasner and James Newman, Mathematics and the Imagination (1940, 1949), 112. Those who are accustomed to judge by feeling do not understand the process of reasoning, because they want to comprehend at a glance and are not used to seeking for first principles. Those, on the other hand, who are accustomed to reason from first principles do not understand matters of feeling at all, because they look for first principles and are unable to comprehend at a glance. In Pensées (1670), Section 7, No. 33. As translated in W.H. Auden and L. Kronenberger (eds.) The Viking Book of Aphorisms (1966), 351. Also translated as “Those who are accustomed to judge by feeling do not understand the process of reasoning, for they would understand at first sight, and are not used to seek for principles. And others, on the contrary, who are accustomed to reason from principles, do not at all understand matters of feeling, seeking principles, and being unable to see at a glance,” in Blaise Pascal and W.F. Trotter (trans. ), 'Thoughts', No. 3, collected in Charles W. Eliot (ed. ), The Harvard Classics (1910), Vol. 48, 9. From the original French, “Ceux qui sont accoutumés à juger par le sentiment ne comprennent rien aux choses de raisonnement, car ils veulent d’abord pénétrer d’une vue et ne sont point accoutumés à chercher les principes. Et les autres, au contraire, qui sont accoutumés à raisonner par principes, ne comprennent rien aux choses de sentiment, y cherchant des principes et ne pouvant voir d’une vue,” in Ernest Havet (ed. ), Pensées de Pascal (1892), 224. Those who judge of a work by rule are in regard to others as those who have a watch are in regard to others. One says, “It is two hours ago”; the other says, “It is only three-quarters of an hour.” I look at my watch, and say to the one, “You are weary,” and to the other, “Time gallops with you”; for it is only an hour and a half ago, and I laugh at those who tell me that time goes slowly with me, and that I judge by imagination. They do not know that I judge by my watch. In Pascal’s Pensées (1958), 3-4. Through space the universe grasps me and swallows me up like a speck. But through thought I grasp it. Penseés trans. A.J. Krailsheimer (1966), No. 13. In Vinoth Ramachandra, Subverting Global Myths: Theology and the Public Issues Shaping our World (2008), 183. To deny, to believe, and to doubt well are to a man what the race is to a horse. In Pensées (1670), Section 25, No. 49. As translated in Blaise Pascal and W.F. Trotter (trans. ), 'Thoughts', No. 260, collected in Charles W. Eliot (ed. ), The Harvard Classics (1910), Vol. 48, 95. A similar translation is in W.H. Auden and L. Kronenberger (eds.) The Viking Book of Aphorisms (1966), 354. From the original French, “Nier, croire, et douter bien, sont à l’homme ce que le courir est au cheval.” in Ernest Havet (ed. ), Pensées de Pascal (1892), 513-514. Vanity is so anchored in the heart of man … and wishes to have his admirers. … Those who write against it want to have the glory of having written well, and those who read it desire the glory of having read it. I who write this have perhaps this desire, and perhaps those who will read it…. In Pensées (1670), Section 2, No. 3. As translated in Blaise Pascal and W.F. Trotter (trans. ), 'Thoughts', No. 150, collected in Charles W. Eliot (ed. ), The Harvard Classics (1910), Vol. 48, 60. A similar translation is in W.H. Auden and L. Kronenberger (eds.) The Viking Book of Aphorisms (1966), 40. From the original French, “La vanité est si ancrée dans le cœur de l’homme … et veut avoir ses admirateurs;… Ceux qui écrivent contre veulent avoir la gloire d’avoir bien écrit; et ceux qui le lisent veulent avoir la gloire de l’avoir lu; et moi qui écris ceci, ai peut-être cette envie; et peut-être que ceux qui le liront…” in Ernest Havet (ed. ), Pensées de Pascal (1892), 122. We are so presumptuous that we would wish to be known by all the world, even by people who shall come after, when we shall be no more; and we are so vain that the esteem of five or six neighbours delights and contents us. In Pensées (1670), Section 2, No. 5. As translated in Blaise Pascal and W.F. Trotter (trans. ), 'Thoughts', No. 148, collected in Charles W. Eliot (ed. ), The Harvard Classics (1910), Vol. 48, 60. A similar translation is in W.H. Auden and L. Kronenberger (eds.) The Viking Book of Aphorisms (1966). From the original French, “Nous sommes si présomptueux, que nous voudrions être connus de toute la terre, et même des gens qui viendront quand nous ne serons plus; et nous sommes si vains, que l'estime de cinq ou six personnes qui nous environment, nous amuse et nous contente,” in Ernest Havet (ed. ), Pensées de Pascal (1892), 122-123. We do not worry about being respected in towns through which we pass. But if we are going to remain in one for a certain time, we do worry. How long does this time have to be? In Pensées (1670), Section 2, No. 7. As translated in in W.H. Auden and L. Kronenberger (eds.) The Viking Book of Aphorisms (1966), 135. Also translated as “We do not trouble ourselves about being esteemed in the towns through which we pass. But if we are to remain a little while there, we are so concerned. How long is necessary? A time commensurate with our vain and paltry life,” in Blaise Pascal and W.F. Trotter (trans. ), 'Thoughts', No. 149, collected in Charles W. Eliot (ed. ), The Harvard Classics (1910), Vol. 48, 60. From the original French, “Les villes par où on passe, on ne se soucie pas d’y être estimé. Mais, quand on y doit demeurer un peu de temps, on s’en soucie. Combien de temps faut-il? Un temps proportionné à notre durée vaine et chétive,” in Ernest Havet (ed. ), Pensées de Pascal (1892), 123. We know that there is an infinite, and we know not its nature. As we know it to be false that numbers are finite, it is therefore true that there is a numerical infinity. But we know not of what kind; it is untrue that it is even, untrue that it is odd; for the addition of a unit does not change its nature; yet it is a number, and every number is odd or even (this certainly holds of every finite number). Thus we may quite well know that there is a God without knowing what He is. Pensées (1670), Section 1, aphorism 223. In H. F. Stewart (ed. ), Pascal's Pensées (1950), 117. We know the truth not only through our reason but also through our heart. It is through the latter that we know first principles, and reason, which has nothing to do with it, tries in vain to refute them. Pensées (1670), trans. A.J. Krailsheimer (1966), Section 1, VI, aphorism 110, 58. We know truth, not only by the reason, but also by the heart. In Pensées (1670), Section 8, No. 6. As translated in Blaise Pascal and W.F. Trotter (trans. ), 'Thoughts', No. 282, collected in Charles W. Eliot (ed. ), The Harvard Classics (1910), Vol. 48, 99. Translated as “We arrive at truth, not by reason only, but also by the heart,” in W.H. Auden and L. Kronenberger (eds.) The Viking Book of Aphorisms (1966). From the original French, “Nous connaissons la vérité, non seulement par la raison, mais encore par le cœur,” in Ernest Havet (ed. ), Pensées de Pascal (1892), 238. We may have three principal objects in the study of truth: one to discover it when it is sought; another to demonstrate it when it is possessed; and a third, to discriminate it from the false when it is examined. As translated in Blaise Pascal and G.W. Wight (trans. ), Of the Geometrical Spirit, collected in Charles William Eliot, The Harvard Classics (1910), Vol. 48, 427. From the original French, “On peut avoir trois principaux objets dans l’etude de la vérité: l’un, de la découvrir quand on la cherche; l’autre, de la démontrer quand on la possède; le dernier, de la discerner d'avec le faux quand on l’examine,” in 'De l'Ésprit Géométrique', Pascal: Opuscules Philosophiques (1887), 82. For an alternative translation, see the quote beginning, “There are three leading objects…” on the Blaise Pascal Quotes page of this website. We run carelessly to the precipice, after we have put something before us to prevent us seeing it. In Pensées (1670), Section 10, No. 5. As translated in Blaise Pascal and W.F. Trotter (trans. ), 'Thoughts', No. 183, collected in Charles W. Eliot (ed. ), The Harvard Classics (1910), Vol. 48, 67. Translated as “…to prevent us from seeing it,” in W.H. Auden and L. Kronenberger (eds.) The Viking Book of Aphorisms (1966), 58. From the original French, “Nous courons sans souci dans le précipice, après que nous avons mis quelque chose devant nous pour nous empêcher de le voir,” in Ernest Havet (ed. ), Pensées de Pascal (1892), 255. What a chimera ... is man ! What a novelty, what a monster, what a chaos, what a subject of contradiction, what a prodigy! A judge of all things, feeble worm of the earth, depository of the truth, cloacae of uncertainty and error, the glory and the shame of the universe! What is man in nature? A Nothing in comparison with the Infinite, an All in comparison with the Nothing, a mean between nothing and everything. In Pensées (1670), Section 1, No. 1. As translated in Blaise Pascal and W.F. Trotter (trans. ), 'Thoughts', No. 72, collected in Charles W. Eliot (ed. ), The Harvard Classics (1910), Vol. 48, 27. From the original French, “Qu’est-ce que l’homme dans la nature? Un néant à l’égard de l’infini, un tout à l’égard du néant, un milieu entre rien et tout,” in Ernest Havet (ed. ), Pensées de Pascal (1892), 102-103. Whatever compass of mind one may have, he is capable of only one great passion. From Blaise Pascal, O.W. Wright (trans. ), 'Discourse on the Passion of Love', collected in Charles W. Eliot (ed. ), The Harvard Classics (1910), Vol. 48, 418. Also widely found translated as, “However vast a man’s spiritual resources, he is capable of but one great passion.” (Webmaster has not yet found a primary source for the translator of this wording. Can you help?) From the original French, “Quelque étendue d’esprit que l’on ait, l’on n’est capable que d’une grande passion,” Discours sur les passions de l'amour (1653) collected in Œuvres Complètes de Blaise Pascal (1866), Vol. 2, 50. When everything moves at the same time, nothing moves in appearance. Quand tout se remue également, rien ne se remue en apparence. From Pensées Art. vi, 27. In Craufurd Tait Ramage, Beautiful Thoughts from French and Italian Authors (1866), 237. When the passions become masters, they are vices. In Pensées (1670), Section 25, No. 104. As translated in Blaise Pascal and W.F. Trotter (trans. ), 'Thoughts', No. 502, collected in Charles W. Eliot (ed. ), The Harvard Classics (1910), Vol. 48, 167. From the original French, “Quand les passions sont les maîtresses, elles sont vices,” in Ernest Havet (ed. ), Pensées de Pascal (1892), 536. When we see a natural style, we are astonished and delighted; for we expected to see an author, and we find a man. In Pensées (1670), Section 7, No. 28. As translated in Blaise Pascal and W.F. Trotter (trans. ), 'Thoughts', No. 29, collected in Charles W. Eliot (ed. ), The Harvard Classics (1910), Vol. 48, 16. Translated as “When we encounter a natural style we are always surprised and delighted, for we thought to see an author and found a man,” in W.H. Auden and L. Kronenberger (eds.) The Viking Book of Aphorisms (1966), 277. From the original French, “Quand on voit le style naturel, on est tout étonné et ravi, car on s’attendait de voir un auteur, et on trouve un homme,” in Ernest Havet (ed. ), Pensées de Pascal (1892), 222. Words differently arranged have a different meaning, and meanings differently arranged have different effects. In Pensées. As translated by W.F. Trotter in Blaise Pascal: Thoughts, Letters, and Minor Works (1910), 15. You see, if the height of the mercury [barometer] column is less on the top of a mountain than at the foot of it (as I have many reasons for believing, although everyone who has so far written about it is of the contrary opinion), it follows that the weight of the air must be the sole cause of the phenomenon, and not that abhorrence of a vacuum, since it is obvious that at the foot of the mountain there is more air to have weight than at the summit, and we cannot possibly say that the air at the foot of the mountain has a greater aversion to empty space than at the top. In letter to brother-in-law Perier (Nov 1647) as given in Daniel Webster Hering, Physics: the Science of the Forces of Nature (1922), 114. As also stated by Hering, Perier conducted an experiment on 19 Sep 1648 comparing readings on two barometers, one at the foot, and another at the top of 4,000-ft Puy-de-Dôme neighboring mountain. ~~[Orphan ? ]~~ Reason is the slow and tortuous method by which those who do not know the truth discover it. I came to biochemistry through chemistry; I came to chemistry, partly by the labyrinthine routes that I have related, and partly through the youthful romantic notion that the natural sciences had something to do with nature. What I liked about chemistry was its clarity surrounded by darkness; what attracted me, slowly and hesitatingly, to biology was its darkness surrounded by the brightness of the givenness of nature, the holiness of life. And so I have always oscillated between the brightness of reality and the darkness of the unknowable. When Pascal speaks of God in hiding, Deus absconditus, we hear not only the profound existential thinker, but also the great searcher for the reality of the world. I consider this unquenchable resonance as the greatest gift that can be bestowed on a naturalist. Heraclitean Fire: Sketches from a Life before Nature (1978), 55. Science can tell us what exists; but to compare the worths, both of what exists and of what does not exist, we must consult not science, but what Pascal calls our heart. 'The Will to Believe' (1896). In The Will to Believe and Other Essays in Popular Philosophy (1897), 22. Distrust even Mathematics; albeit so sublime and highly perfected, we have here a machine of such delicacy it can only work in vacuo, and one grain of sand in the wheels is enough to put everything out of gear. One shudders to think to what disaster such a grain of sand may bring a Mathematical brain. Remember Pascal. The Garden of Epicurus (1894) translated by Alfred Allinson, in The Works of Anatole France in an English Translation (1920), 187. As far as I see, such a theory [of the primeval atom] remains entirely outside any metaphysical or religious question. It leaves the materialist free to deny any transcendental Being. He may keep, for the bottom of space-time, the same attitude of mind he has been able to adopt for events occurring in non-singular places in space-time. For the believer, it removes any attempt to familiarity with God, as were Laplace’s chiquenaude or Jeans’ finger. It is consonant with the wording of Isaiah speaking of the “Hidden God” hidden even in the beginning of the universe … Science has not to surrender in face of the Universe and when Pascal tries to infer the existence of God from the supposed infinitude of Nature, we may think that he is looking in the wrong direction. From 'The Primeval Atom Hypothesis and the Problem of Clusters of Galaxies', in R. Stoops (ed. ), La Structure et l'Evolution de l'Univers (1958), 1-32. As translated in Helge Kragh, Cosmology and Controversy: The Historical Development of Two Theories of the Universe (1996), 60. Foreshadowings of the principles and even of the language of [the infinitesimal] calculus can be found in the writings of Napier, Kepler, Cavalieri, Pascal, Fermat, Wallis, and Barrow. It was Newton's good luck to come at a time when everything was ripe for the discovery, and his ability enabled him to construct almost at once a complete calculus. In History of Mathematics (3rd Ed., 1901), 366. Kepler’s discovery would not have been possible without the doctrine of conics. Now contemporaries of Kepler—such penetrating minds as Descartes and Pascal—were abandoning the study of geometry ... because they said it was so UTTERLY USELESS. There was the future of the human race almost trembling in the balance; for had not the geometry of conic sections already been worked out in large measure, and had their opinion that only sciences apparently useful ought to be pursued, the nineteenth century would have had none of those characters which distinguish it from the ancien régime. From 'Lessons from the History of Science: The Scientific Attitude' (c.1896), in Collected Papers (1931), Vol. 1, 32. 19 Jun - short biography, births, deaths and events on date of Pascal's birth.